Apparently, 2013 was a down year for Christmas cereals. We still had Christmas Crunch holding down the fort, but other than that, there wasn’t much. Even stretching, and trying to find “winter” or “holiday” cereals, the shelves were pretty dry. Today, I was able to find one last minute addition to the season’s assortment. Instead of being in the cereal section, Target had tucked this away next to Christmas cookie decorations in their seasonal section. But fear not, because it didn’t remain hidden forever! 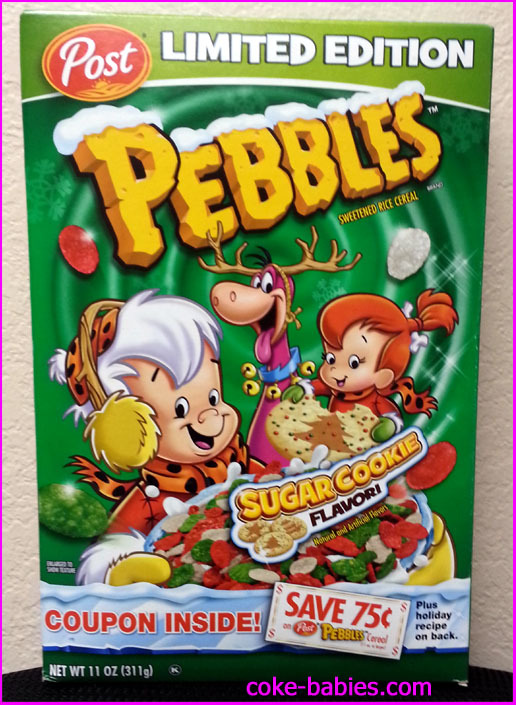 Sugar Cookie Pebbles, or Pebbles – Sugar Cookie Flavored, depending on how you want to read the packaging, is Post’s latest “Limited Edition” cereal. This makes sense, since it would be odd to see a box of cereal with Pebbles and Bam Bam wearing gloves and earmuffs during the summer. When I saw “sugar cookie”, I was expecting it to taste like an industrial-strength version of “frosted” cereals. 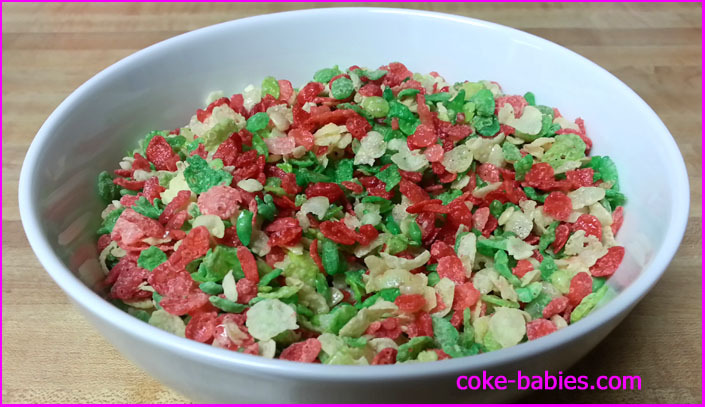 Rice Krispies Treats Cereal exposed to TCRI mutagen. Opening the box, my theories were confirmed. It had a sugar / “frosting” flavor that was so strong, it was almost disgusting. The scent would put those horrifying “Christmas Cookie”, etc. Yankee Candles to shame, or at the very least make those seem subtle by comparison. The smell didn’t exactly entice me to eat the cereal, but for science, and all, I soldiered on. Surprisingly, and more accurately thankfully, the taste is nowhere near as strong as the smell. The smell also dissipates greatly in the bowl, rather than coming from the smell-funnel of the box. Taste-wise, it’s about what you’d expect. Rice Krispies Treats Cereal, or any “sugar” or most “vanilla” flavored cereals taste about the same. Except with this, it comes in Pebble form. Which means being vigilant and constantly scraping down the sides of your bowl to keep the cereal in the milk. Otherwise they will harden and permanently affix themselves to your bowl, possibly forever. Thanks, Post, for doing your part and giving us a seasonal cereal. It was pretty good. Merry Christmas to everyone – don’t look at the bottom of the box in the first picture, or it will spoil the surprise that I am getting you a valuable seventy five cent discount off cereal for your present. One of the things I look forward to most during Christmastime is seeing what new candy will be released. I haven’t had much luck this year, due to two swing-and-a-miss Gingerbread chocolates, but I still kept my eyes open. I would say that the lessened importance of receiving presents is some sign of maturity in myself, but there is also the fact that I introduced this by saying that finding new candy is basically the most important thing to me. So we’ll call it a wash. In what can only be described as a Christmas miracle, I found three new (to me, anyway) chocolate bars that have redeemed the previous lackluster candies this year. Only one of them is “Christmas-y”, but all three were in the same display box, so I’m counting them. According to the packaging, Wild Ophelia is younger sister of Vosges Haut-Chocolat. Or, in less pretentious terms – “Vosges Fancy Chocolate”. I assume the Vosges part is the same in both cases. 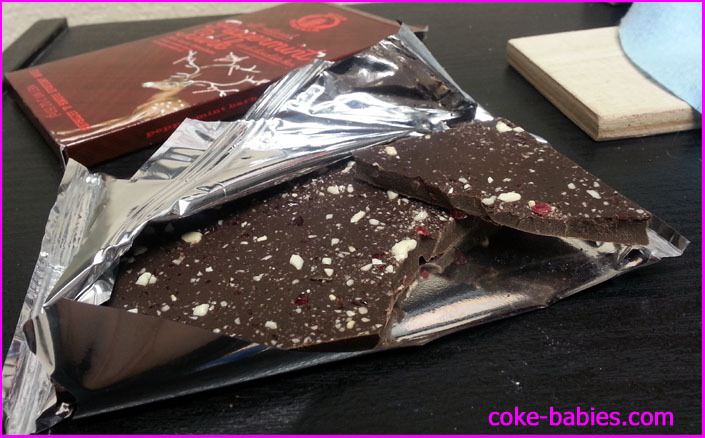 I had included two Vosges bars in my chocolate bar assortment review a few years back. Both were very good. Hopefully, their sister company’s output would be as solid. To be honest, I wasn’t super excited for these three bars. 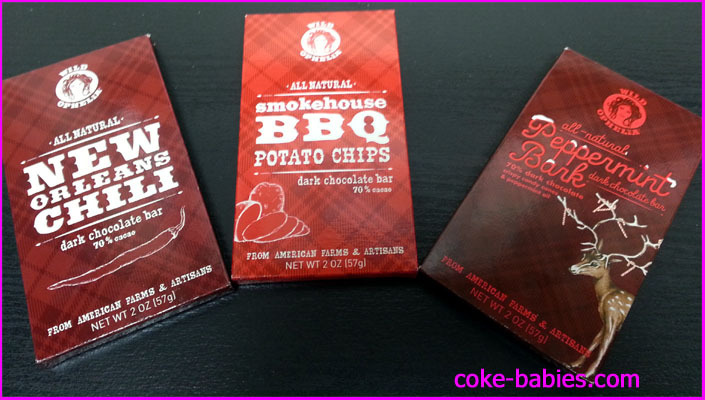 I’ve had plenty of dark chocolate with chilis, peppermint chocolate is usually underwhelming, and the “BBQ” aspect of the chips sounded disgusting. With that exciting intro out of the way, let’s dig in! First up was the New Orleans Chili. 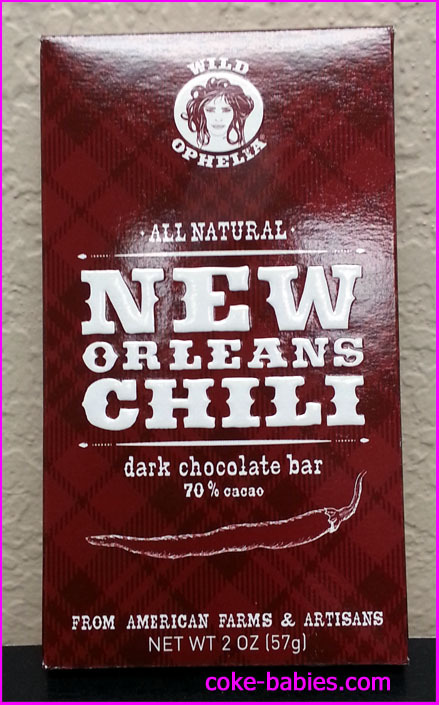 I would have preferred a red beans and rice chocolate bar, but chili bars are usually very good. Some err too light on the chili pepperss, some too much, but even when companies get it wrong, it’s usually enjoyable. The bar itself is… not exciting at all. No fancy design, no chunks of pepper, so strong chili smell – it just looks like a standard bar of chocolate. Thankfully, the chocolate itself is very good. Personally, the aftertaste is the weakest part. The packaging describes it as “underlying tones of earthy red pepper.” The “earthy” part is accurate – I get a very mild aftertaste of what can only be described as “dirt”. Which isn’t to say this bar isn’t good – the chocolate itself is fantastic And it’s got just enough heat where the spice is rising in your mouth and you think, “Okay this is getting spicier, hopefully it stops…” and the heat stops rising just when it seems like it should. The dirt flavor does compliment the slightly bitter 70% chocolate, so all in all the dirt aftertaste works out. Wild Ophelia has my full permission to include my dirt comparisons on any future packaging, should they choose to do so. Despite being mildly creeped out by the “BBQ” aspect, I was looking forward to the Smokehouse BBQ flavor the most of the three. The “chocolate & potato chip” aspect wasn’t creepy, in fact it’s awesome. 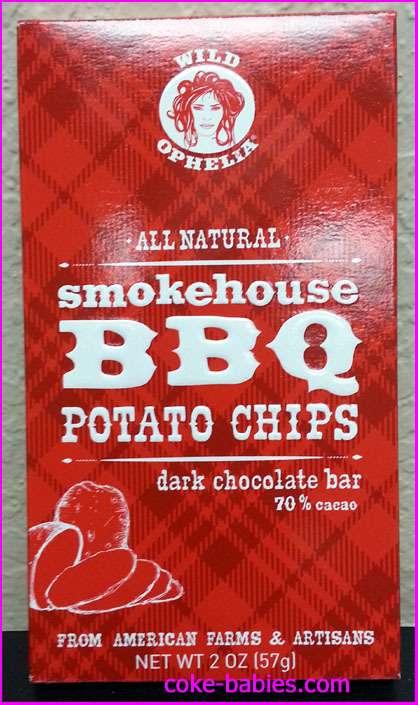 Chocolate-covered potato chips are fantastic. I know that the sweet and salty go together wonderfully. But adding the barbecue flavoring to the mix raises my suspicions. Looking at the bar, you’d be hard pressed to tell there were chips in there. It looks more like crisped rice. Although I knew there wouldn’t be entire chips in there, so I’m not actually sure why I feel the need to specify they’re small pieces. Ignore this last paragraph. They use the same 70% dark chocolate from the chili bar, so I already knew the chocolate would be good. What was shocking was just how well the barbecue chips work. I was expecting more of a sweet and salty flavor, with either (hopefully) a hint of barbecue or (no please) a large, gimmicky barbecue punch to the face. Most surprising is there isn’t even much of a salty flavor to the chocolate. I don’t know if they just used mostly barbecue chip spices and didn’t salt them, or what. In the reviews of the two previous gingerbread chocolates, I complained about a strange, savory aspect to them. In the Smokehouse BBQ bar, there’s no strangeness about them, because the savory flavor belongs, and somehow makes sense. 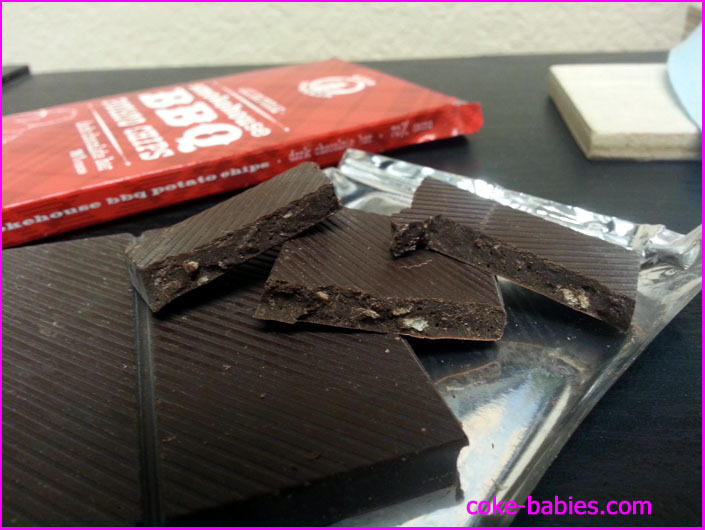 There’s not a lot of barbecue, but just enough to mix well with the chocolate, and leave you with a surprising, and possibly shameful, very enjoyable aftertaste. The last bar is the one I was looking forward to the least. Chocolate and mint bars usually just taste like peppermint extract, and the ones with candy cane pieces are annoying to chew. According to the packaging, this bar contains both peppermint oil and candy cane pieces. Yay! 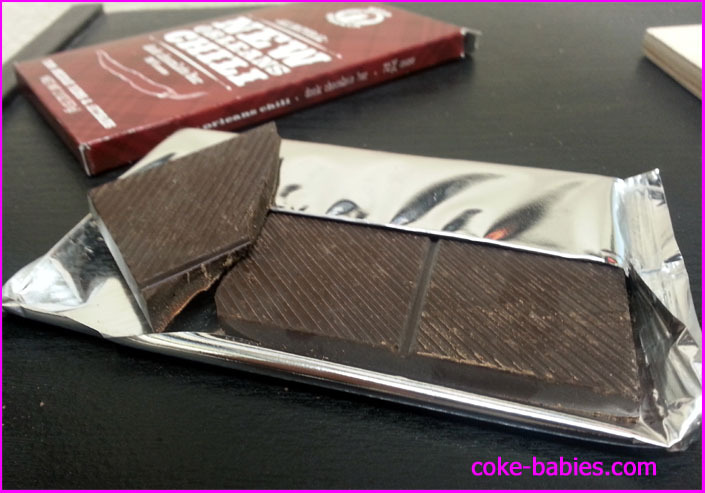 What is immediately different about this chocolate is the texture. Where the previous two bars had a snap to them, and a nice tough bite, the Peppermint Bark bar is much softer. It’s like a firmer version of Ice Cubes chocolate. Despite my not liking candy cane pieces in chocolate, it can’t be denied that it makes this bar very nice to look at – especially compared to their other, simple bars. 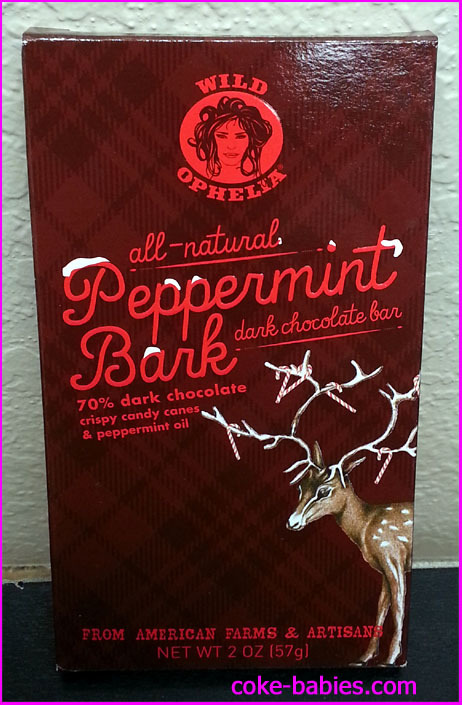 While I wouldn’t choose this as one of my desert island foods (metaphorically speaking, any chocolate would be a terrible choice for a hot and unrefrigerated climate), their Peppermint Bark bar made me come around to this flavor more. The fact that the peppermint didn’t taste fake, and somehow the candy canes didn’t get stuck in my teeth definitely helped. After trying all three bars, I went on their site to see what other flavors they have. Unfortunately, most of their other flavors that sound awesome are white chocolate based – AKA they don’t sound awesome anymore. But they have two varieties of chocolate bars with beef jerky in them, both of which must be immediately acquired by me. Given my overwhelming journalistic integrity, I will let you know the results of those bars. Unless I forget. Considering how M&M’s consistently have about forty different varieties in their rotation at any given time, it’s odd how Twix has never managed to consistently keep supporting flavors around. 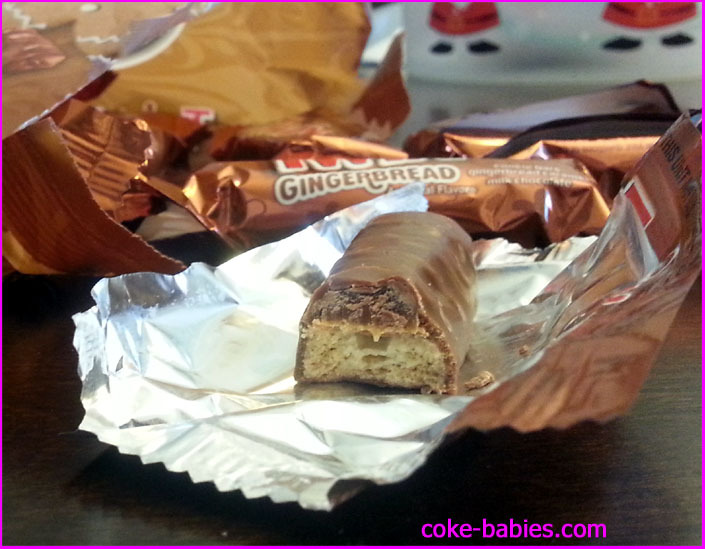 PB Twix is around in limited distribution, but that doesn’t really count. They have become the weirdo brother of Caramel that makes random appearances once in a while. The only one you see on store shelves on a regular basis is Caramel Twix. This is a shame, since when Twix was fully represented by four flavors in the early nineties, Twix was a force to be reckoned with. Chocolate Fudge Twix was mediocre, Cookies ‘n’ Cream was awesome, and the other “standard” two were as good as always. Then, Chocolate Fudge and Cookies ‘n’ Cream died unceremonious deaths. And Peanut Butter Twix was forced into retirement, brought out of retirement, put back, and its sad cycle continued. 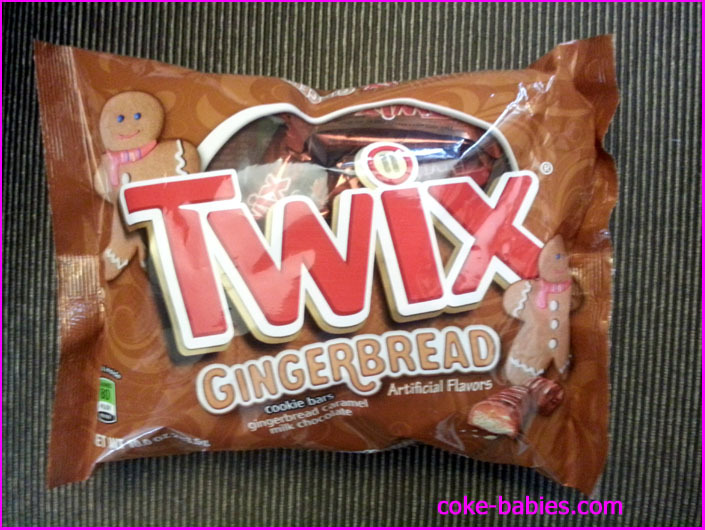 Given Twix’s sordid history, I was excited about Gingerbread Twix. 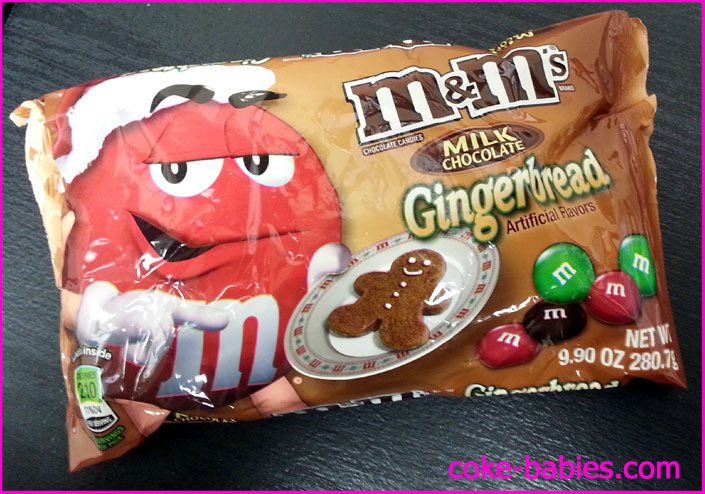 After my recent, “meh” experience with Gingerbread M&M’s, my hopes weren’t super high, but I still held out hope. As you can see, they didn’t go especially wild with the packaging. No red and green, gold, or any of the super Christmas-y color palette. Instead they went with the bold artistic vision of “it’s like our normal brown packaging, except more brown!” At least they threw a couple gingerbread men on there. I like the “Gingerbread” font – something about it reads slightly Wonka-ish. The individual wrappers are more of a brownish-bronze than the outside packaging is, and this looks a little better. But in the end, it’s still a shiny brown wrapper… yay? Upon first bite, there’s not much there – similar to the Gingerbread M&M’s. Then, eventually you get a wave of gingerbread. And that wave of gingerbread flavor is… not very good. My biggest complaint with these gingerbread-flavored candies is that the gingerbread flavor has an offensively artificial taste. With a flavor like this that can easily go wrong, the added flaw of fakeness amplifies the overall strange flavor. All of this adds up to a very mediocre Twix. 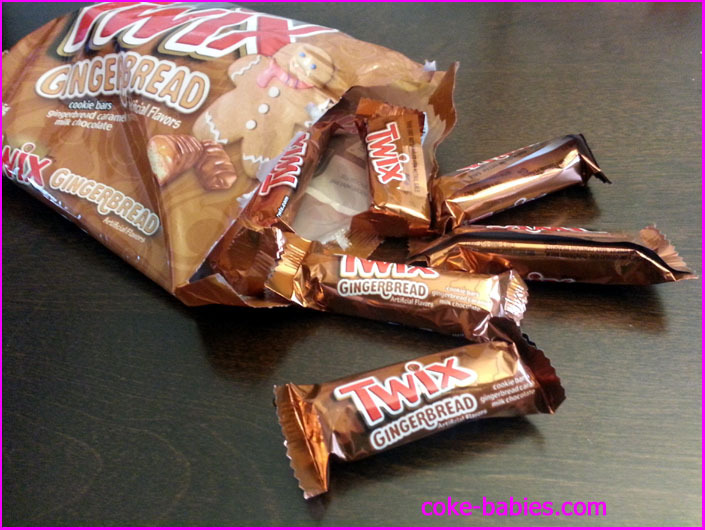 Christmas is almost here, so I don’t think I’ll be seeing any more new gingerbread candy on the shelves for a while. If I did see one, I would think to myself, “I have not had good luck at all with that flavor this year, I shouldn’t buy this.” Then I will buy it, because I am an idiot. Feel free to head on over to the review of Pumpkin Spice M&M’s for a refresher on my ambivalence towards M&M’s. Then, I guess, come back here, since telling a reader to go somewhere else in the first sentence probably isn’t a great tactic. Despite this just being another seasonal M&M’s flavor, the concept of “new flavor!! 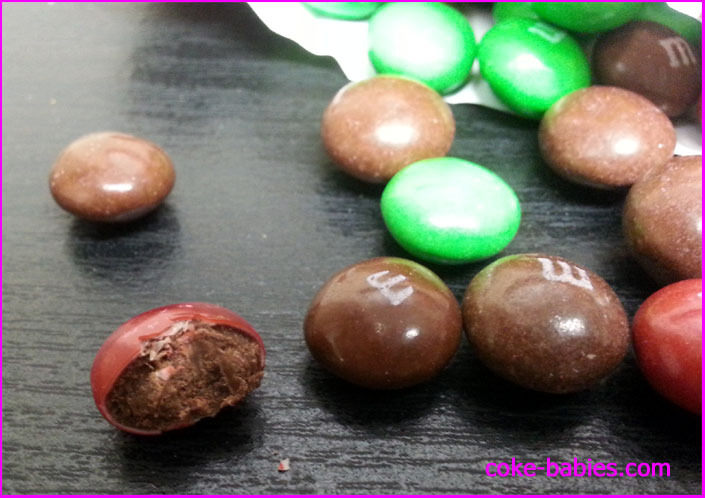 !” supersedes the blandness of M&M’s, and still manages to pique my interest. One of the most noticeable aspects of the packaging is Red’s weird, almost lewd gesture. I’m not sure why I’m sexualizing his facial expression and suggestive point. But what other reasoning would there be to point at a gingerbread man like that. You wouldn’t slyly tell someone “Hey, guess what I’ve got. Shh – not so loud! This is a secret!” It’s just a lazily-decorated cookie. I’m not particularly surprised by the perverted gestures of Red on the packaging, since based on their commercials the M&M’s lead very deviant lifestyles. They are lusted after at parties, where humans either want to mate with them or simply consume their insides. Then when the parties they apparently frequently attend get extra wild, they proceed to rip off their own flesh. Sickening beasts. So before even trying the candy, I was a little put off. There’s also the matter of – do you know what gingerbread-flavored treats taste good? Gingerbread. You know what gingerbread-flavored treats taste mediocre to bad? Mostly everything else that’s gingerbread-flavored. Still, I was grateful the flavor wasn’t “Egg Nog” (especially since that would probably white chocolate-based – UGH). 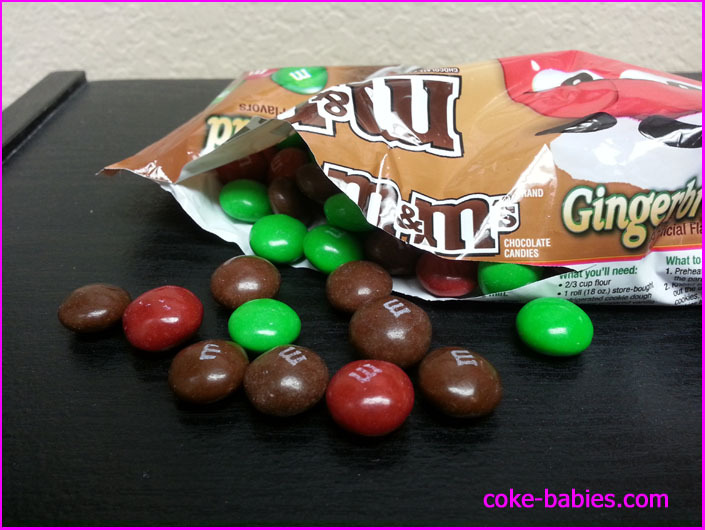 The Gingerbread M&M’s come in three colors – red and green for Christmas, and brown for the gingerbread. Or there was just a surplus of brown at the factory. It’s not an overtly savory flavor – M&M’s didn’t release the equivalent of a Jones soda novelty flavor. There’s just enough of a hint of it to make you uneasy. After about five of them, I was sort of wishing I didn’t have an entire bag left to consume. This is where I get to look like a generous person, by leaving out a candy dish filled with them. People will get to enjoy these, all while consuming germs from everyone else who has touched them – win win! If you want a good “wintery” M&M, Mint Chocolate M&M’s are the go-to. Gingerbread are a pass.